Students usually end up miscalculating the amount of casting fluid required for casting. In this way , the lab inventory is getting wasted. 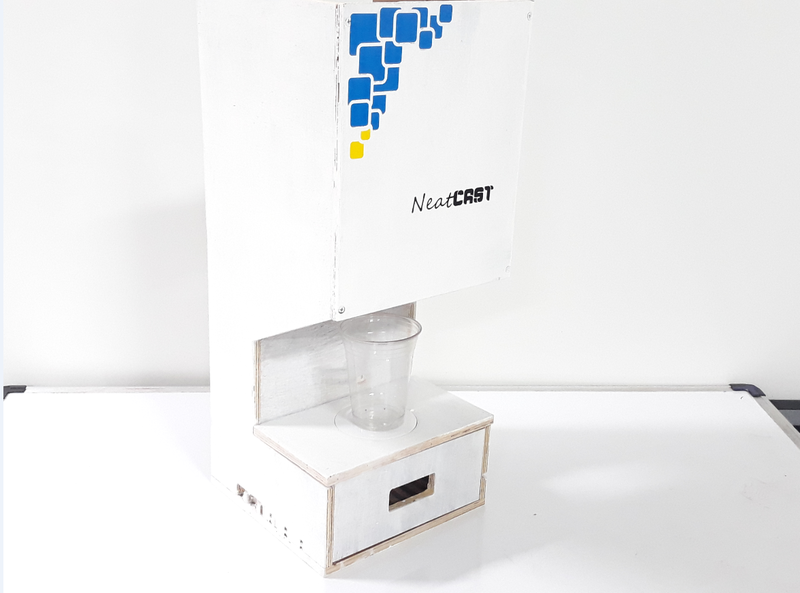 NeatCAST is a machine that can carefully measure and dispense the amount of fluid required for the particular casting. The machine is controlled via a mobile app where the user selects the material intended for casting and chooses the amount of material that is required to be dispensed.For the demo, water is used. This is where that for using solenoid valve there should be more pressure in the fluid. So demo using resin was a hard choice. When mixing the fluid the working area usually becomes very dirty. The hands get messy while handling these fluids also mixing the viscous fluids carefully is a tedious process. The machine is controlled using a mobile app. The volume of the fluid required for the casting is entered by the user. When the amount of fluid required for the casting operation is entered into the machine either in volume or in weight. The machine then precisely dispenses the fluid required by measuring the weight using a load cell.